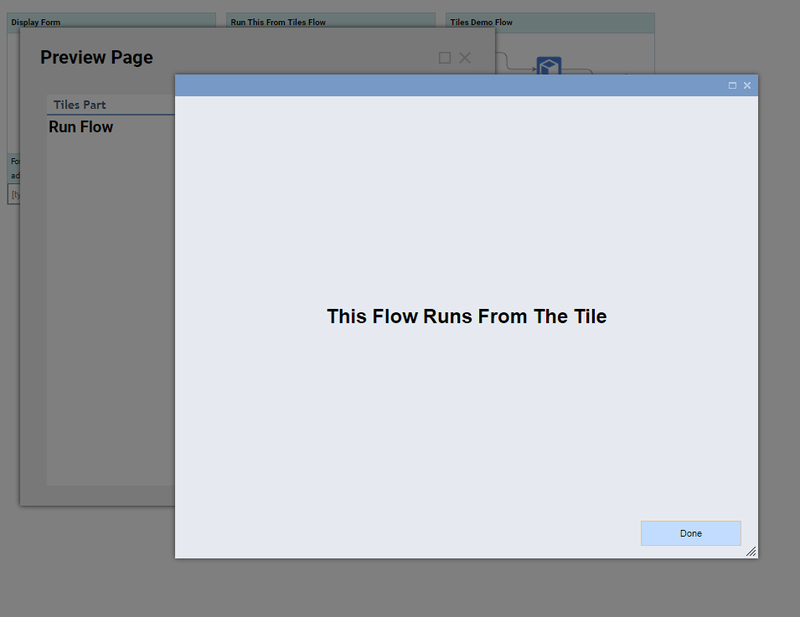 This tutorial demonstrates how to Run	a Flow	on Tile	click on the Page	. 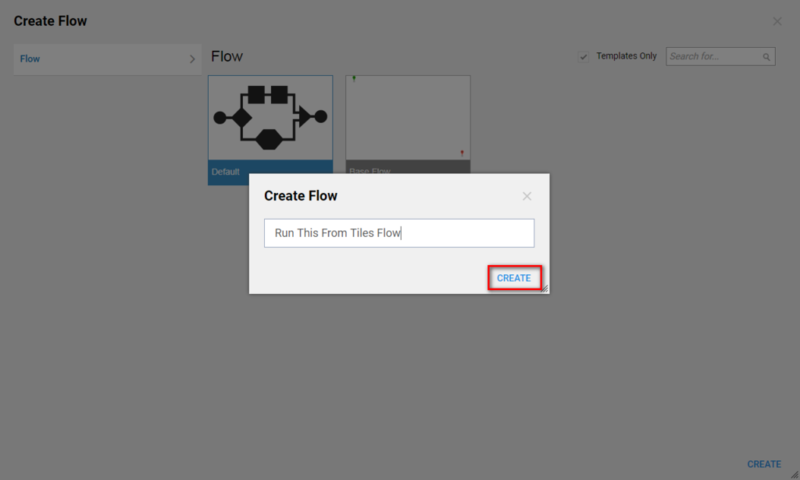 In Decisions 4.0 it is possible to launch a Flow	when user clicks on Tile	component on the Page . 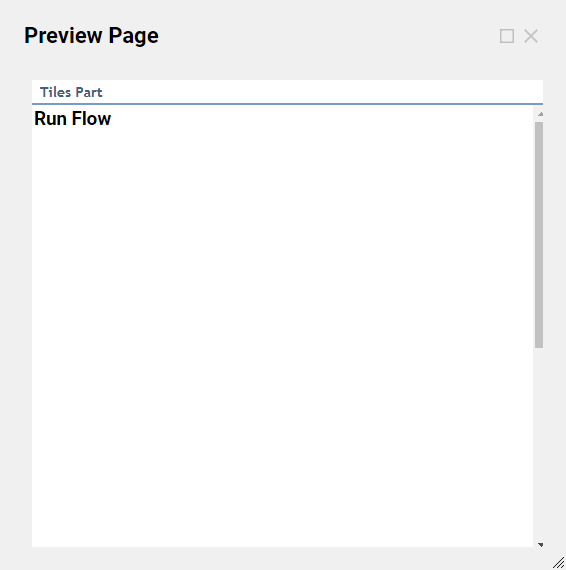 Begin in the Designer Folder	with selecting Create Flow	on the Folder Actions Panel. 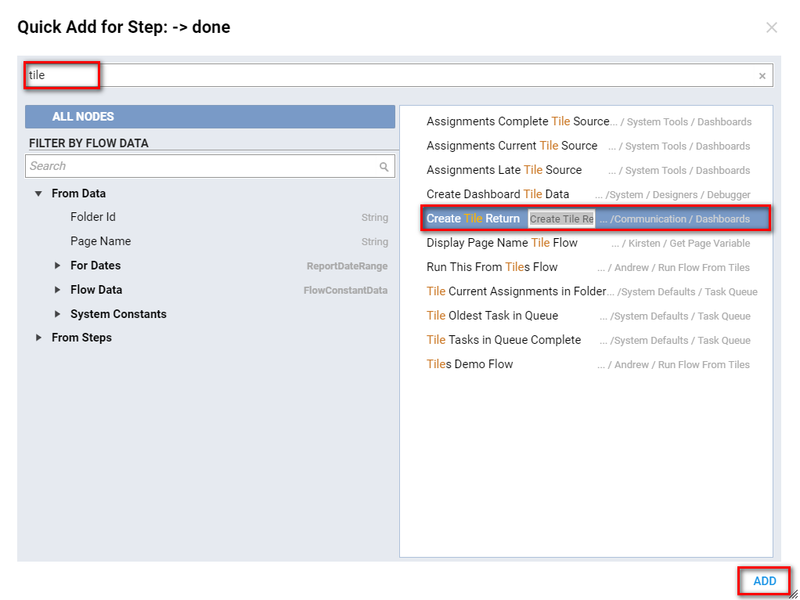 Then, Name	the Flow and select CREATE	to proceed to the Flow Designer. 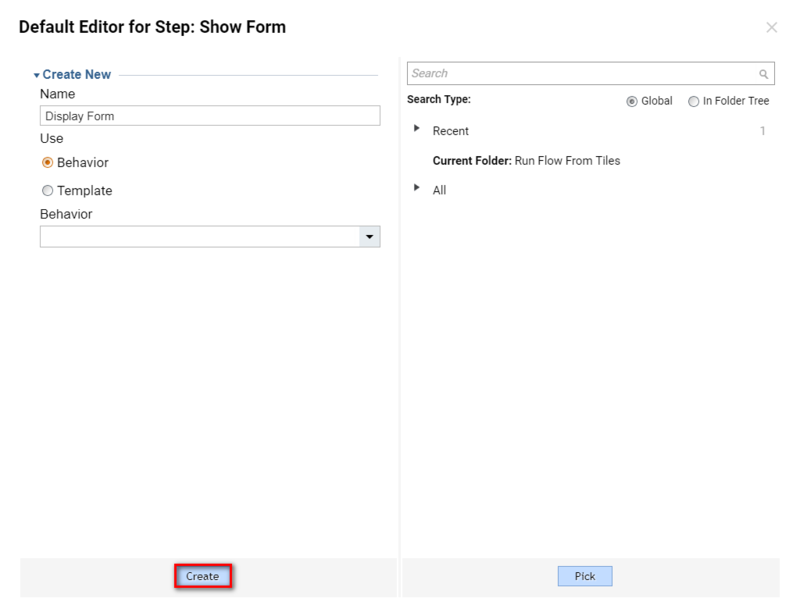 In the Flow Designer addShow Form	step from Favorite Steps	category. 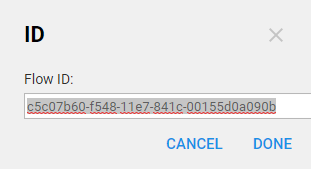 Then, we Name	a Form and click Create	to proceed to the Form Designer. 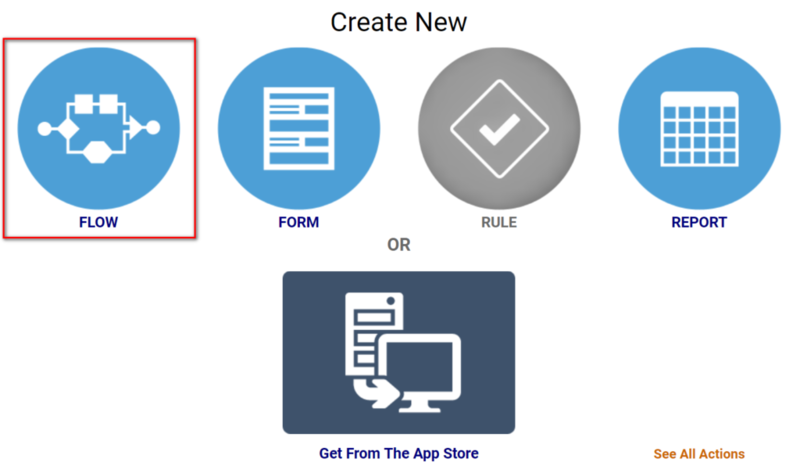 Our Form has only a Label	and a Button	control for user to be able to submit the Form . When we finished designing the Form we can save the Form and close Form Designer. Back in the Flow Designer we connect outcome from the Form	to the End Step	in our Flow . This completes our Flow . We can save the Flow and close Flow Designer. Next, we are going to create our Tile Flow	. In our Tile Flow we are going to need FlowId	of the Flow	we want to run. We locate our simple Flow	. On the thumbnail menu we clickAction > Manage > Get Flow ID. Then, we copy Flow Id	to the clipboard. 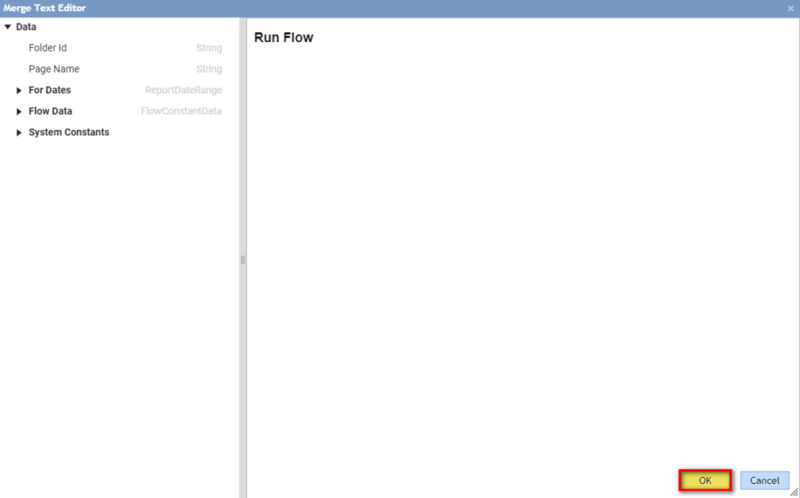 Then, we Name	the Flow and select CREATE	this opens Flow Designer. 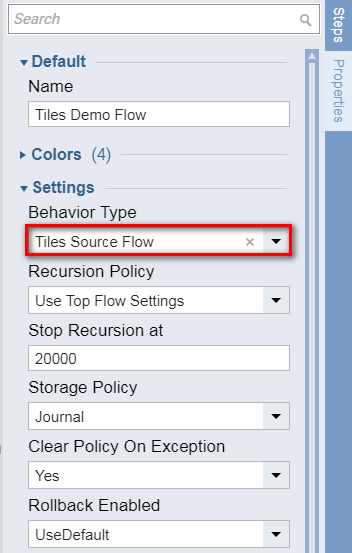 In the Properties panel under Settings	pick Tiles Source Flow	from Behavior	drop-down. 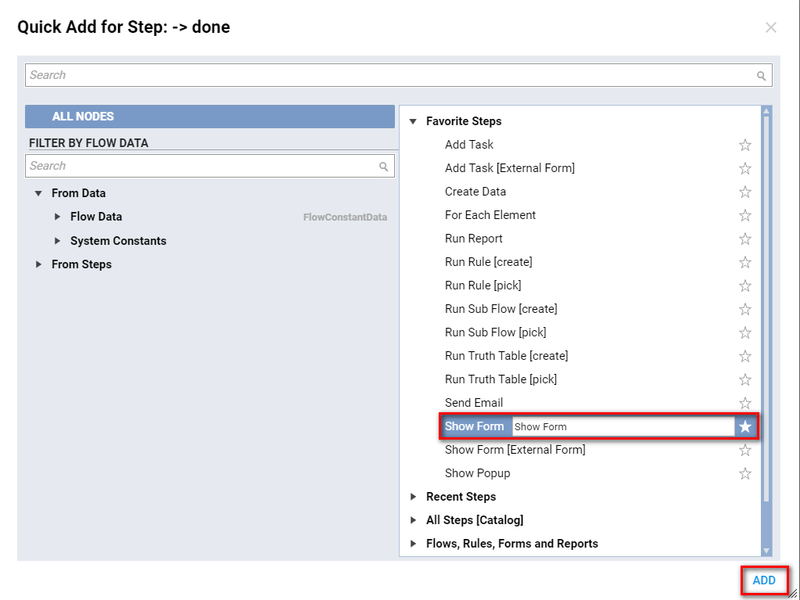 In the Flow Designer we add Create Tile Return	step fromAll Steps [Catalog] > Communication > Dashboards	category. 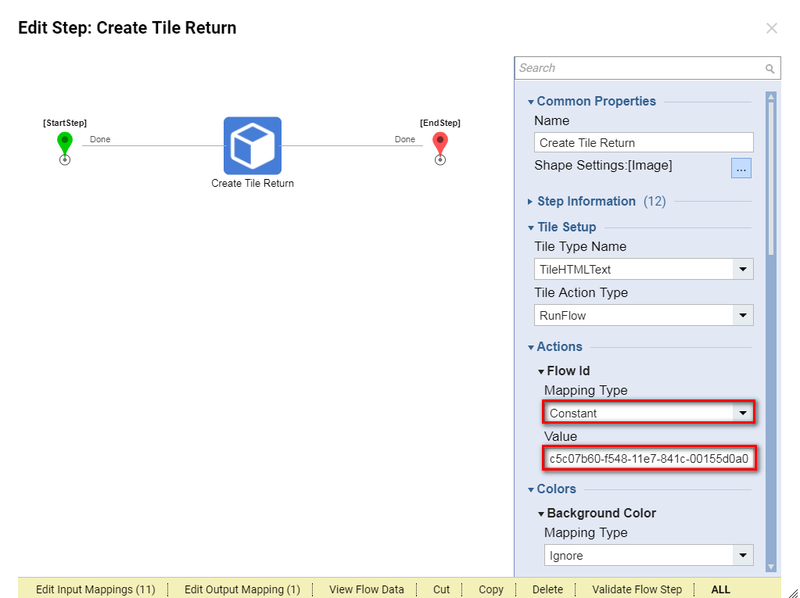 Then, we select Create Tile Return on the work-space to configure it. We locate Tile Setup	settings, and from Tile Type Name	drop-down we select TileHTMLText	. 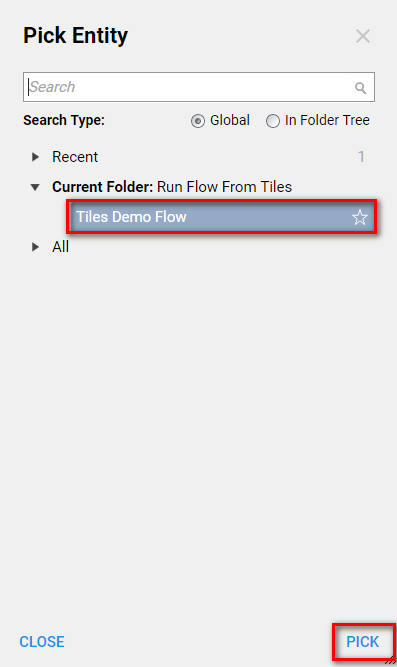 Next, from the Tile Action Type	drop-down we pick RunFlow	. 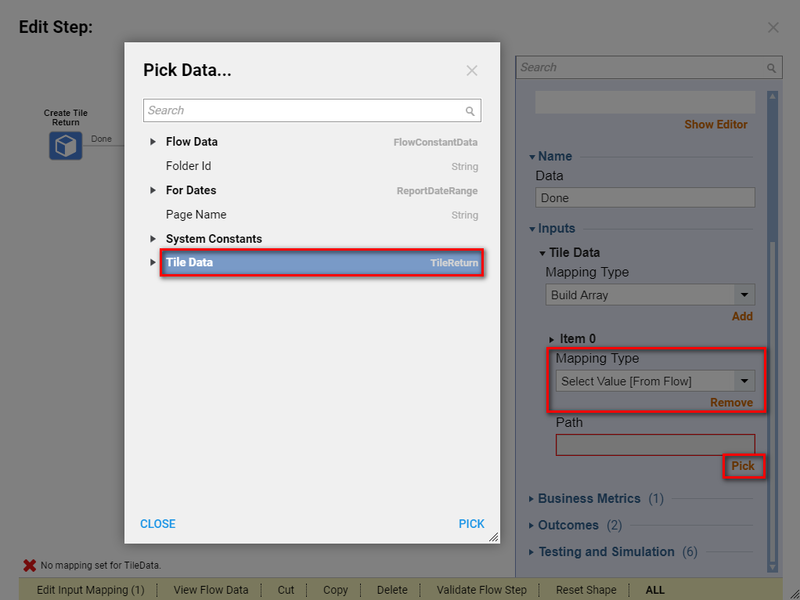 In Actions	settings we locate Flow Id	, define Constant	Mapping Type , and provide Value with Flow Id	that we copied previously in this tutorial. Then, we locate Tile Data	settings. For the Html Text	we pick Text Merge.HTML	Mapping Type. And, we click Show Editor	for the Merged text. 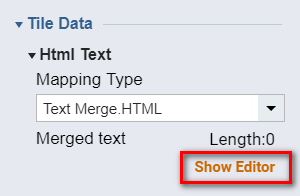 In the Merge Text Editor	we design our HTML text for the Tile	and click Ok	to save and continue. Next, we connect the outcome from Create Tile Return	step to the End Step	in our Flow . Our End Step should output Tile Data	collection of Tile Return Type. 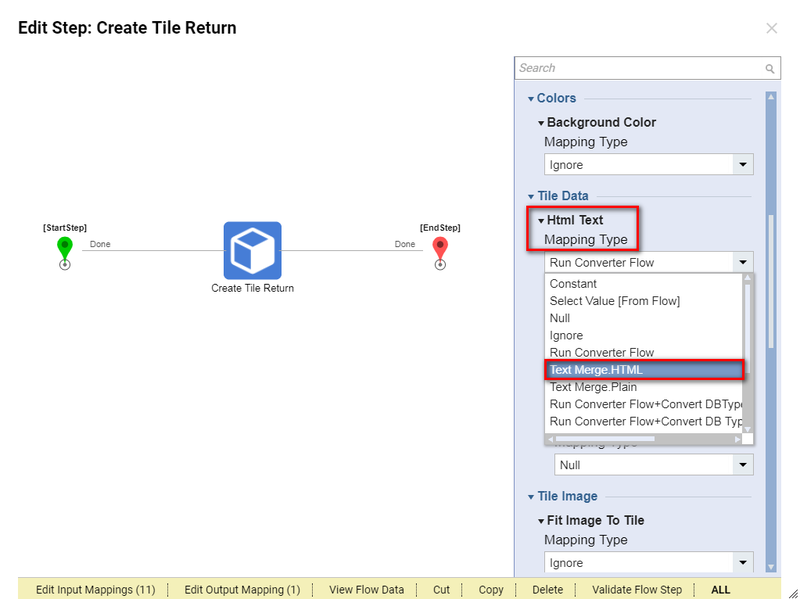 We locate Tile Data Input	on the End Step , and selectBuild Array	Mapping Type. 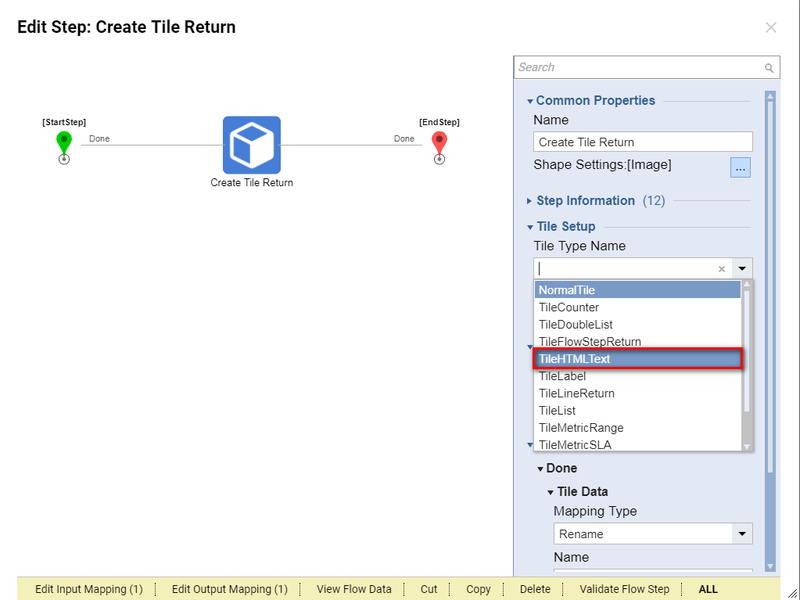 Then, for the first Item	in our Array weSelect Value	of the Tile Data outcome fromCreate Tile Return	step in our Flow . This completes our Tile Flow	. We can save the Flow and close Flow Designer. Back in the Designer Folder we are going to create a simple Page to test our Tile . 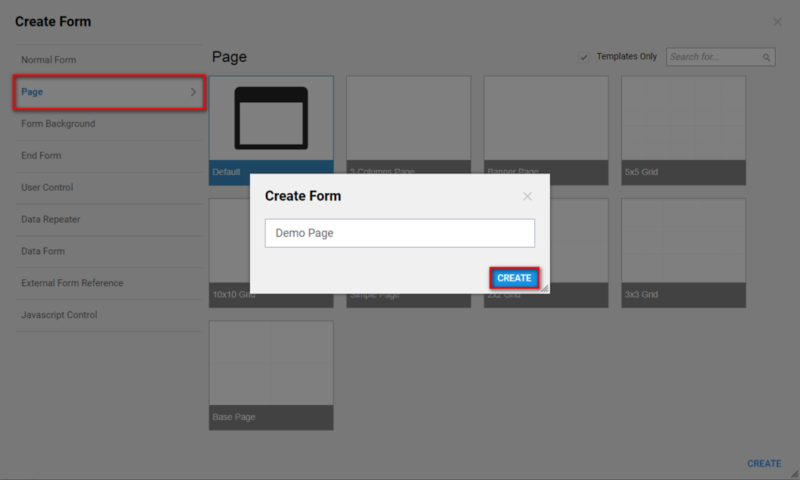 We click Create Report/Page > Create Page/Dashboard	on the Folder Actions Panel. In the resulting window we Name	the Page and click Ok	to proceed to the Page Designer. 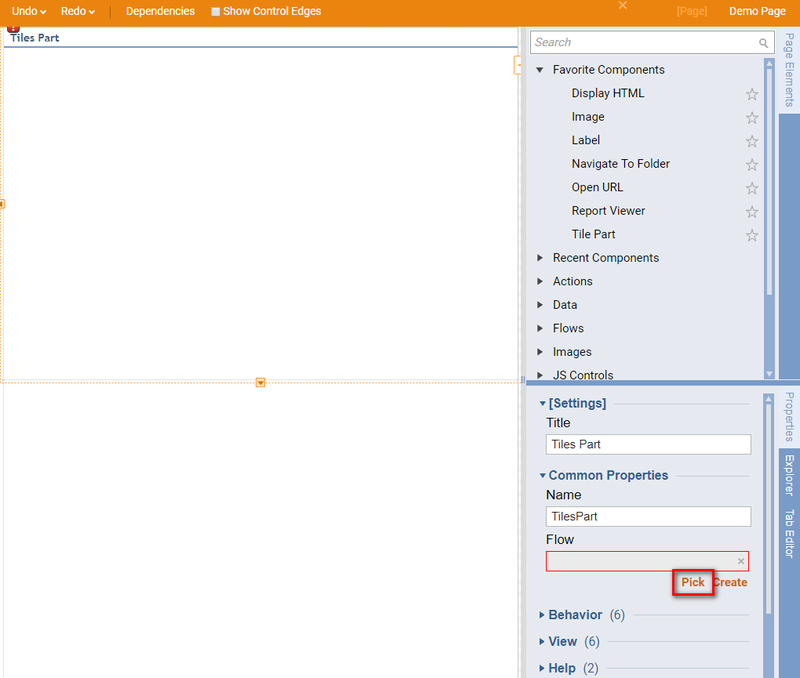 In the Page Designer we search for Tiles Part	component and add it to our Page . 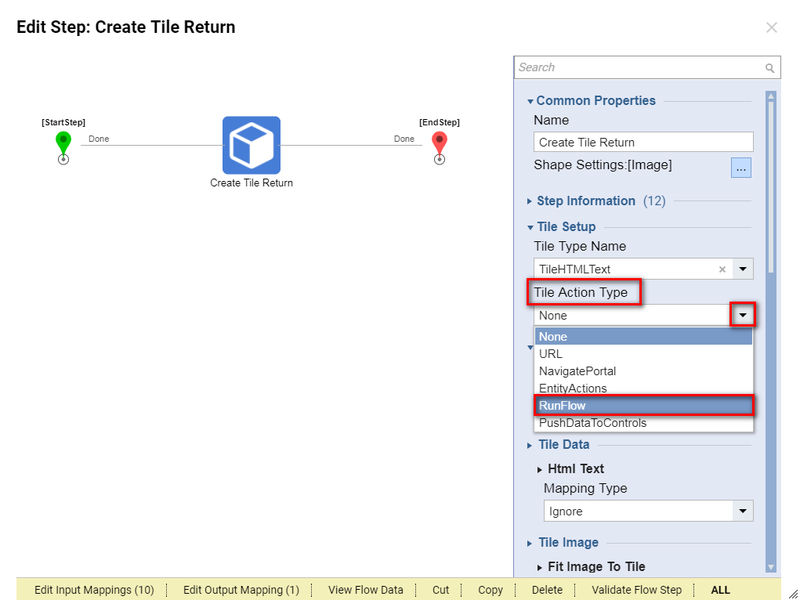 In the Common Properties	for the Tile	component we Pick	Flow . 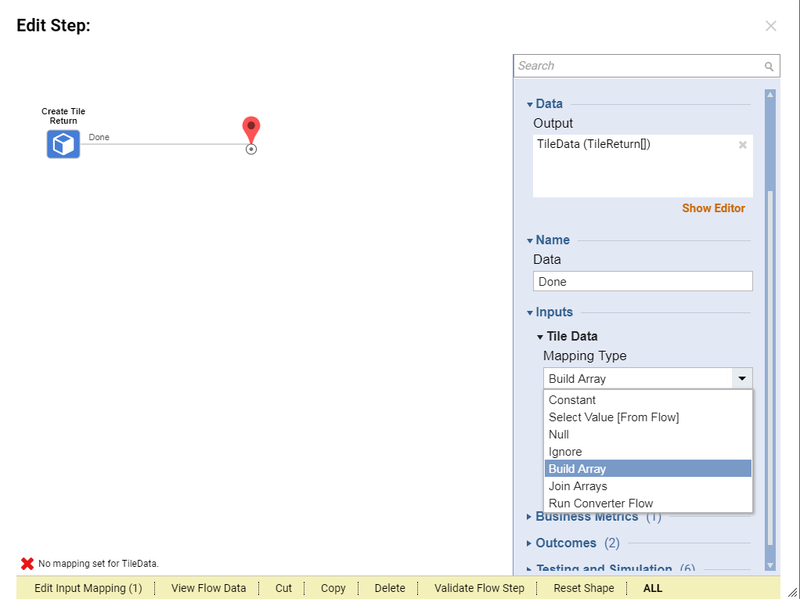 Then, we locate our Tiles Demo Flow	and click PICK	. This completes our Page design. We can save the Page and close Page Designer. Back in the Designer Folder we locate our Page , and from the thumbnail’s	Action menu we click View > Preview Page. Our Page displays and we can see HTML text on the Tile Component. 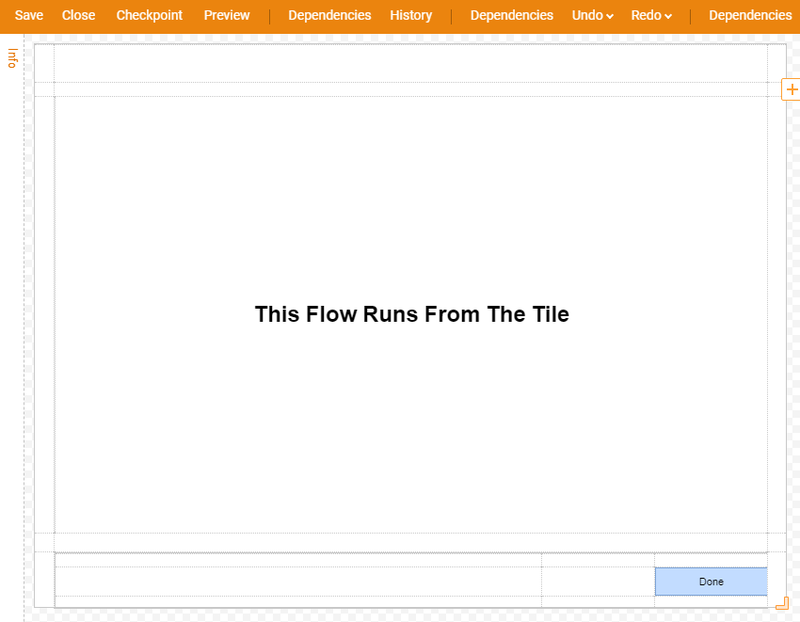 If we click on the Tile	component, our simple Flow launches and we can see the Form that we designed in that Flow . We click Done	to close the Form and complete the Flow .